Cut back on coffee shop expenses with this Vanilla Chiller. It has all the sweetness you'll want thanks to a vanilla coffee, ice cream and chocolate blend. Place coffee and dark chocolate in blender; cover. Blend on high speed until chocolate is chopped into small pieces. Add ice cream; cover. Pulse until smooth. 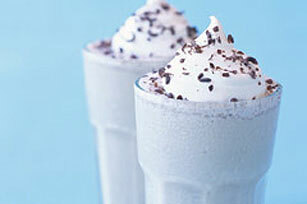 Pour into three tall glasses; top with whipped topping and grated chocolate. Try preparing with either low-fat chocolate or coffee frozen yogurt instead of the vanilla ice cream. Omit BAKER'S Chocolate. Grate enough additional Swiss dark or milk chocolate nougat to measure 3/4 tsp. Sprinkle over whipped topping garnish as directed.